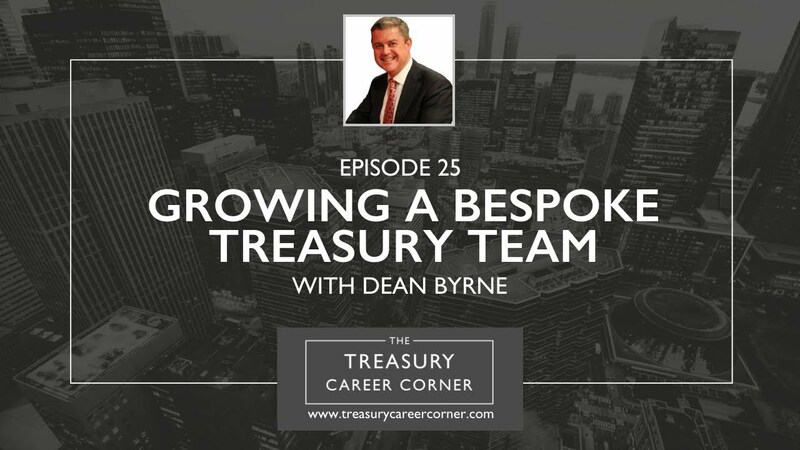 We’ve got another exciting episode of the Treasury Career Corner podcast ready for you to dive into and in this episode, I’m joined by Dean Byrne, the Group Treasurer at JLT Group. JLT Group (Jardine Lloyd Thompson Group plc) is a British multinational corporation that has its headquarters in London, England. It provides insurance, reinsurance, employment benefits advice and brokerage services, and it is a constituent of the FTSE 250 Index. Dean is a career-long treasurer with experience in a number of sectors including manufacturing, shipping, logistics, and financial services. He has particular experience of treasury department start-up situations, management of bank relationships, including significant funding and refinancing and the structuring and implementation of currency risk and global cash management programmes. He has also worked closely with various tax departments in the structuring and implementation of international tax structures. Additional experience includes the review and restructuring of group insurance and risk control programmes including the management of group insurance brokers. A behind-the-scenes look into Dean’s various treasury roles throughout his career including Chloride Group plc, moving to EAC Container Lines as Divisional Treasurer and working as Group Treasurer at Kidde plc, etc.